It’s going to be a bizarre experience this upcoming fall when Penn State football fans don’t see No. 88 suiting up in the blue and white and making big catches for the Nittany Lions. As Mike Gesicki leaves Happy Valley as the all-time leader in receptions, yards and touchdowns by a tight end, his skillset will translate very well to today’s NFL as a pass-first option at the position. 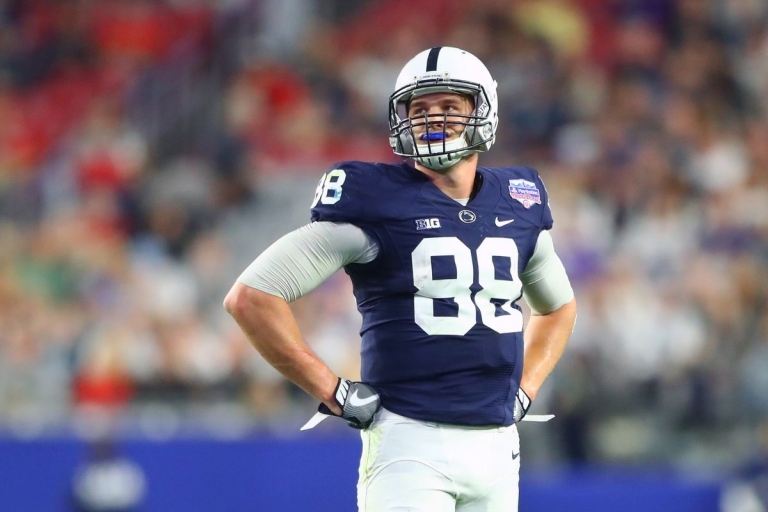 Gesicki is currently projected to be taken in the late-first or early-second rounds, and there are a few teams where the Nittany Lion great could fit in seamlessly. Ever since Jimmy Graham left the bayou, the Saints have had trouble finding a reliable option at the tight end spot in the passing game. With the emergence of a two-headed beast in the backfield with Alvin Kamara and Mark Ingram, Michael Thomas looking like a long-term deep threat on the edges and Drew Brees showing little sign of slowing down going into next season at 39-years-old, a big-framed tight end could complete one of the offense of one of the NFC. Coby Fleener only was targeted on 5.6 percent of the teams passing plays, and also is a danger of being released due to his injury history and inconsistency. Bringing in Gesicki, who at 6’6” and 250 pounds is almost identical to Fleener physically, could reinvigorate the position with young talent for the Saints and allow them to add another athletic tight end to rival those in Minnesota and Philadelphia. After potentially drafting his teammate in the top four picks of the first round, the Browns continue to build their offense around young talent. Personally, I have the Browns picking a quarterback at the top of the draft and a skill player, most likely Saquon Barkley if he’s available. Following an offseason where the Browns were able to acquire Jarvis Landry, Tyrod Taylor, and Damarious Randall, the Browns can add Gesicki to one of the most intriguing offenses in the AFC. I still the Browns have some work to do on the defensive side before they can start competing in the AFC North, but getting a big, reliable tight end for a young quarterback will only help the development of both. Personally, I don’t think that Gesicki will fall this far down, but the tight end class is pretty shallow this year. Dallas Goedert and Hayden Hurst are right up there with Gesicki, so it’s possible that he could be the third off the board at the position. The fact of the matter is that Jason Witten will be 36-years-old when (or if) he starts the 2018 season in Dallas. He declined in targets, receptions, yards and yards per reception in 2017, and it’s very realistic to think that this will be Witten’s final season as the Cowboys have playoff aspirations in the NFC. If Gesicki is available at this pick, the Cowboys have to pull the trigger. Witten has been a staple of Jason Garrett’s red zone offense his entire career, and Gesicki could fill the role for Dak Prescott going into his third season as quarterback. If the Cowboys are able to get a wide reciver to potentially replace Dez Bryant, who seems to be getting frustrated with the organization and skills seem to be declining, adding Gesicki to the offense could set up the Cowboys for years to come.